I received the bag this morning.It is my friend simply amazing.The quality Is of the highest order and I am very happy. thanks so much for everything you have done for me,I appreciate it alot. I look for forward to getting my next bag done with you soon.Thanks very very much. The bag has arrived, it looks great and Sarah is very grateful! 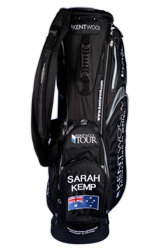 Thank you for the photos of Sarah Kemp's carry bag. As always the bag looks great. Your workmanship is impressive!